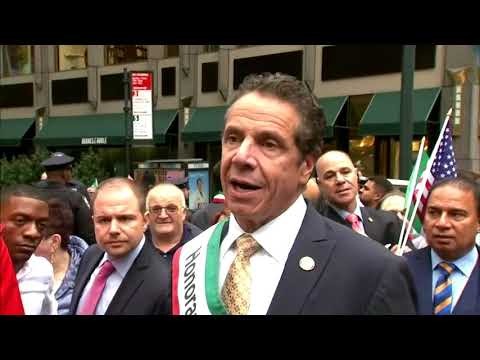 SCHOHARIE, N.Y. (AP) — The supersized limousine that crashed and killed 20 people outside a country store failed a safety inspection last month and shouldn’t have been on the road, and the driver wasn’t properly licensed, New York’s governor said Monday. The state moved to shut down the owner, Prestige Limousine, as state and federal authorities investigated the cause of Saturday’s wreck in Schoharie. The company said it was taking its cars off the road while conducting its own probe into the crash. The crash about 170 miles north of New York City came three years after another deadly stretch-limo wreck in New York state spurred calls for Gov. Andrew Cuomo to examine such vehicles’ safety. There is no evidence the state took any steps to do so. As victims’ relatives tried to come to grips with the tragedy that happened as a group of friends and family were on their way to a 30th birthday party, authorities had yet to say how fast the limo was going or determine why it failed to stop and sped off the road at the bottom of a long hill. The 19-seater vehicle had at least some seat belts, but it was unclear whether anyone was wearing them, National Transportation Safety Board Chairman Robert Sumwalt said. Investigators plan to examine the mangled limo’s data recorders and mechanical systems as well as the road, which has a history as a danger spot. They are also looking into the driver’s record and qualifications and conducting an autopsy to see if drugs or alcohol were factors. But officials already saw some red flags, Cuomo said: The driver didn’t have the necessary commercial license, and the vehicle failed a state inspection that examined such things as the chassis, suspension and brakes. He also said the limo — built by cutting apart a heavy-duty SUV and lengthening it — had been created without federal certification, though NTSB officials said they hadn’t yet determined whether the vehicle met federal standards. Prestige Limousine issued a statement Monday expressing condolences to victims’ families and saying it was conducting “a detailed internal investigation” while also meeting with state and federal authorities. The Gansevoort, New York-based company said it pulled its cars from the road voluntarily. But state police say they seized four Prestige cars, including the one that crashed. Federal records show the company has undergone five inspections in the past two years and had four vehicles pulled from service. In inspections Sept. 4, the company’s limos were cited for defective brakes, lack of proper emergency exits, flat or balding tires, defective windshield wipers, and other maintenance problems. Federal transportation records show Prestige is owned by Shahed Hussain, who worked as an informant for the FBI after the Sept. 11 attacks, infiltrating Muslim groups by posing as a terrorist sympathizer in at least three investigations. In one case, he helped convict men accused of plotting to bomb New York synagogues. His role at the FBI was assailed by civil liberties groups, who accused him of helping the FBI entrap people. Asked Monday about Hussain, the FBI wouldn’t comment. The limousine, built from a 2001 Ford Excursion, ran a stop sign at a T-shaped intersection at the bottom of a hill and slammed into an unoccupied SUV. Investigators have yet to determine whether the driver tried to brake. The crash left no visible skid marks, but that might be due to misty weather or anti-lock brakes, Sumwalt said. Authorities haven’t released the driver’s name, but friends and relatives identified him on social media as Scott Lisinicchia. AP reporter Michael Hill talks about the investigation looking into a limousine crash that killed 20 people on Saturday in upstate New York. More than 1,000 people jammed into a park in Amsterdam to honor the victims and their families Monday night. “We are crushed with you. We are crushed for you,” U.S. Rep. Paul Tonko told a crowd that spilled onto a bridge spanning the Mohawk River. Some relatives shed tears as a woman sang “Amazing Grace.” The ceremony ended with everyone lifting their candles above their heads in unity. The crash appeared to be the deadliest land-vehicle accident in the U.S. since a bus full of Texas nursing home patients fleeing 2005′s Hurricane Rita caught fire, killing 23. Saturday’s wreck was the nation’s deadliest transportation accident of any kind since a 2009 plane crash near Buffalo, New York, killed 50 people. Factory-built limousines must meet stringent safety regulations. But luxury cars converted to limos, like the one in Saturday’s crash, often lack such safety components as side-impact air bags, reinforced rollover protection bars and accessible emergency exits. Few federal regulations govern limos modified after leaving the factory. Regulations often vary by state. “It certainly is the Wild West out there when it comes to limousines and stretch vehicles,” said National Safety Council CEO Deborah A.P. Hersman. Ford said in a statement that it has never made its own stretch version of the Excursion. It did certify outside companies to modify them to Ford specifications for up to 14 seats during the 2001 model year, but it wasn’t clear who modified the SUV that crashed Saturday. After a stretch limousine was T-boned on New York’s Long Island in 2015, killing four women, a special grand jury implored Cuomo to examine the safety of such vehicles. Lawmakers, including Democratic Sen. Chuck Schumer of New York, asked federal officials several years ago to raise safety standards for stretch limos modified after manufacture. Caserta reported from New York. Contributing to this report were Associated Press writers Michael Balsamo, Jennifer Peltz and Jim Mustian in New York; Mary Esch in Latham, N.Y.; David Klepper in Albany, N.Y.; and AP Auto Writer Tom Krisher in Detroit.